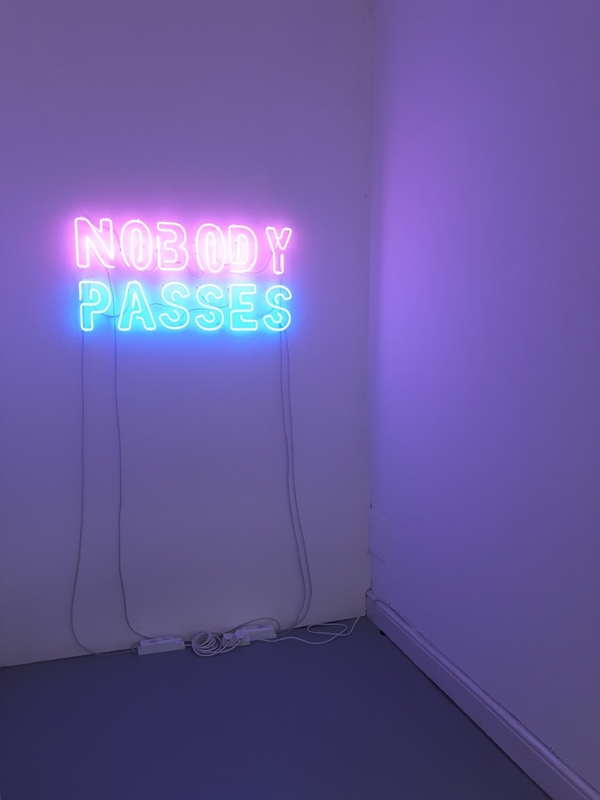 Nobody Passes, 2018, neon, H450 x W900mm. Whilst the use of neon lighting has declined since the 1960’s, it is still a prevalent form of advertising in most British seaside towns. Nearly every restaurant and bar along the seafront has a neon light claiming to be the best in town. Amusement arcades display neons advertising huge jackpots and great prizes and piers frequently have neons to announce their latest rides and attractions. Despite the over inflated nature of these doubtable and often deceptive claims, these signs serve their purpose as adverts to visiting tourists. This work serves a related purpose, acting as an attractive advert that encourages the public to enter the gallery. 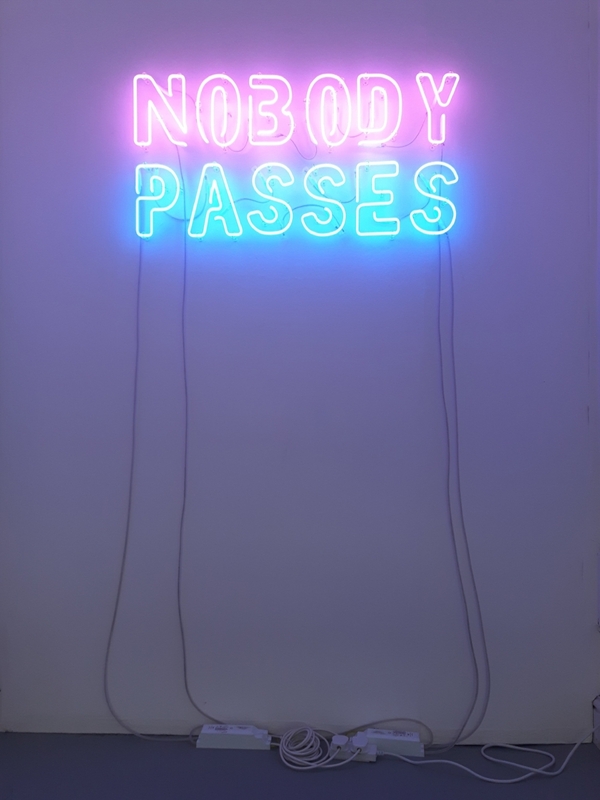 However, the claim that ‘nobody passes’ may appear potentially misleading when installed at the entrance to the exhibition. Fox’s intention is for visitors to question their ability to pass uninterrupted into the exhibition, and their right to do so when such a bold claim is made against them. 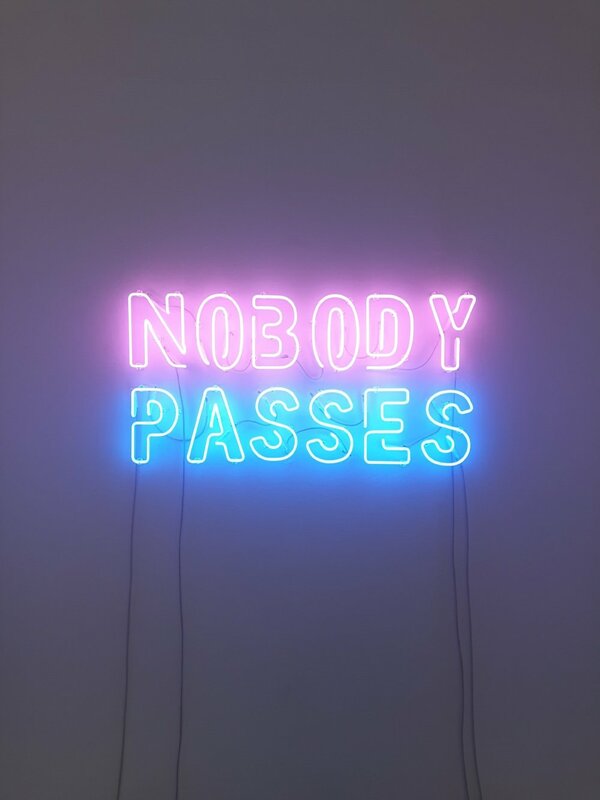 As with similar neons found at the seaside, visitors to the exhibition are left to doubt the claim, drawing attention to the fact that nobody really passes as anything. In this way, this work aims to prompt a dialogue around the problematic concept of ‘passing’, which suggests transgender people are ‘passing as’ their gender identity rather than it being who they are. There is also a certain level of privilege associated with this, as many transgender people experience a shift in public perceptions during their transition.